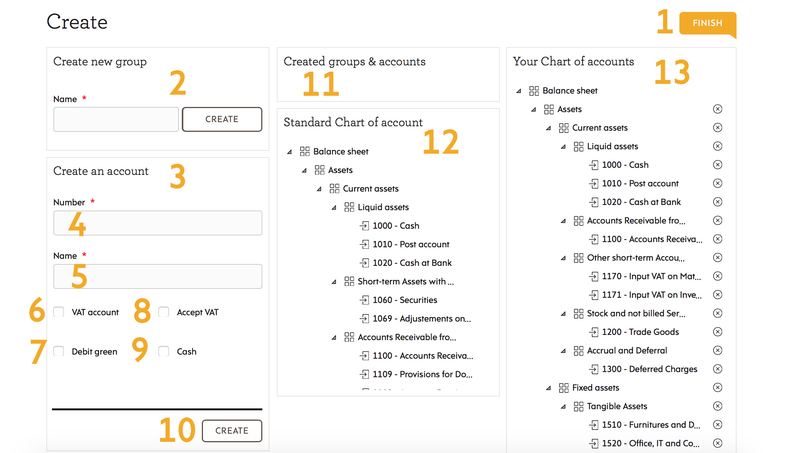 The fourth and last tab to create a new accounting is “Chart of account”. Create in this window a new group which can receive accounts. Create in this window some new accounts. The number of the account has to have 4 figures. Select if the account is a receiving account for the counterparties of VAT during writings of VAT. Select if the account accepts the VAT. Select a specific code if you want that this code is registered by default when you use this account to make one book-entry. Select if the account is a cash account as the bank or the cash. Swiss official chart of accounts : Take and slide the accounts which you need from this chart of accounts to your chart of accounts. Your chart of accounts. Modify an account by double clicking above. You can arrange the accounts and the groups as you want .